Who says you can't get fall colors in Southern California? All the fruit has been picked & the peach trees are turning mahogany. It's been a great season for the orchard in 2012. We had lots of u-pickers: families with young children, twenty-somethings looking to can fruit for the first time, even two church groups. We had a grand time hosting them. Jack particularly likes to take kids out on the hay wagon. But fall is upon us & it's time to start thinking about pruning the trees. But we can't prune until the leaves have dropped & that's about a month off. I guess we just have to enjoy the fall colors. We walked into the orchard two days ago to find a swarm of bees attached to an apple tree. They obviously came from nearby but we don't know where. We used to keep bees but we got rid of the last of our hives about five years ago. Each of the hives had swarmed several times & we always see lots of honey bees on the blossoms in the spring so we know they are around. We thought the swarm would have found their new home by now. They'll be gone soon, but we tiptoe around the tree until they leave. It's so great this time of year in the orchard. So many fruits are ripe. This is what we have to choose from today: three yellow peaches, one white peach, one white nectarine, one yellow nectarine, two apples, one pear, & one Asian pear. The stone fruit are all sweet, tangy, & juicy. Don't dare eat one without a bib! We're freezing apricots again. This time, we have a vacuum sealer, which should keep freezer frost off the apricots, leaving them much nicer when they are defrosted. Jack likes to have several for breakfast every morning, so we're trying to freeze enough to last a whole year. We're netting the cherry trees this week because the cherries are almost ripe. We're trying to stay one step ahead of the birds...it's really hard because they can eat fruit really fast & they'll eat it before we're ready to pick it. We have our big opening day in a week and a half...just in time for the air show on the same weekend. What fun! Here's Jack with one of the Patterson apricots. It's about the size of an olive. At this point, they are pretty much beyond the danger of being damaged by frost. 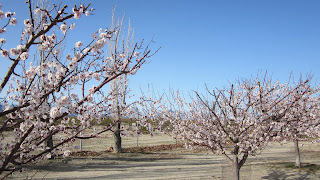 We're still keeping an eye on the peaches & nectarines since they are not as far along. They look like little threads peaking out from the center of a fading flower. April is a touchy month...it can be very warm, but it can also bring freezes. As long as the temperatures don't drop below 28 for more than an hour or so, we should be okay. It's the most beautiful time of year. The trees are covered with clouds of pink & white blossoms. 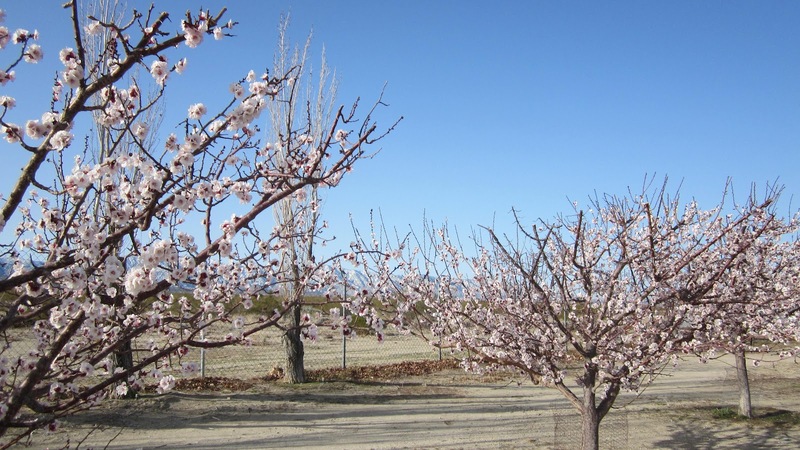 These are the first to bloom - Patterson apricots. others are in full glory. It snowed in the mountains yesterday, so if you look closely you can see the fresh snowfall in the background. When the weather is warm enough, the bees are buzzing around, thousands to each tree. So very soon they will have done their work, the flowers will fall off, & tiny fruits will appear. We just planted 39 new trees! 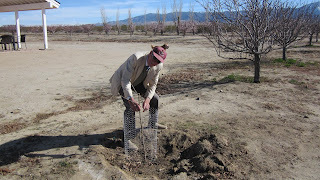 Here's my husband Jack Brian planting one of the new plums. We removed some of the older trees to make room. The first planting was in 1993 & we'd never moved any out before. It was more than time...trees have a definite life span. 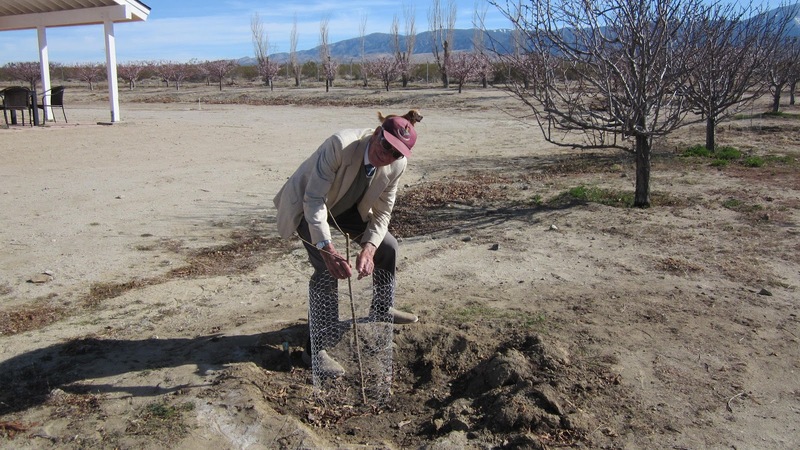 We planted 20 plums, divided between Santa Rosa & Satsuma, & 6 peaches - a new late variety called Late Alamar. The rest were assorted peaches & apples as well as 2 figs. Now we just have to wait 3 years until they are mature enough to bear fruit. One of our pilots said he could already taste the figs!